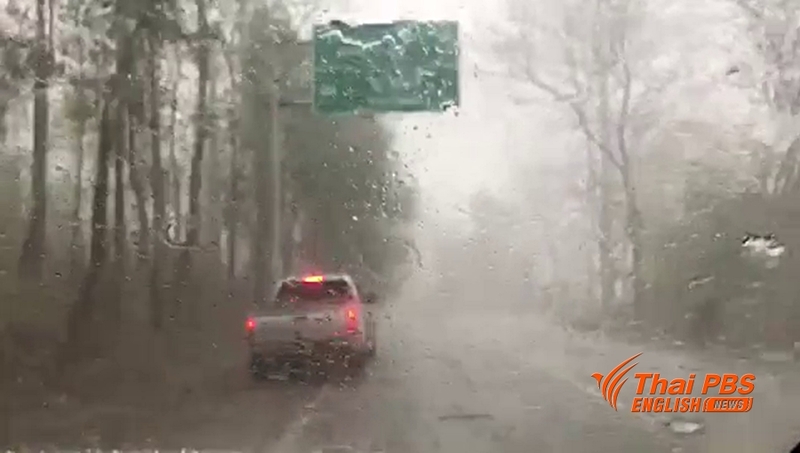 The Thai Meteorological Department warned people in most parts of the country except the southern and eastern regions to brace for another round of summer storms during April 15-18. In an announcement issued Wednesday (April 11) , the Weatherman said that the Northeast and the East would be hit by thunderstorm, strong wind and lightning with hail storm in certain parts on April 15 followed by the northern and central regions, including Bangkok, which would face the turbulent weather on the following day. The freak storms were attributable to the cold front from China which will blanket upper part of Thailand and the South China Sea as Thailand is experiencing hot weather. Northeastern provinces to face summer storms include Udon Thani, Nong Khai, Bueng Kan, Sakon Nakhon, Nakhon Phanom, Mukdahan, Kalasin, Maha Sarakham, Roi Et, Yasothon, Amnat Charoen, Ubon Ratchathani, Si Sa Ket, Surin and Buri Ram. In the East, Nakhon Nayok, Prachin Buri, Sa Kaeo, Chanthaburi and Trat will be hit by the freak storms.